After a week without power, internet, regular food, and just about any semblance of normal life, it was extraordinarily comforting on Saturday to get back to something familiar — a show. This wasn’t just any event though, but prolific nyctaper-recordees Woods at Music Hall of Williamsburg. 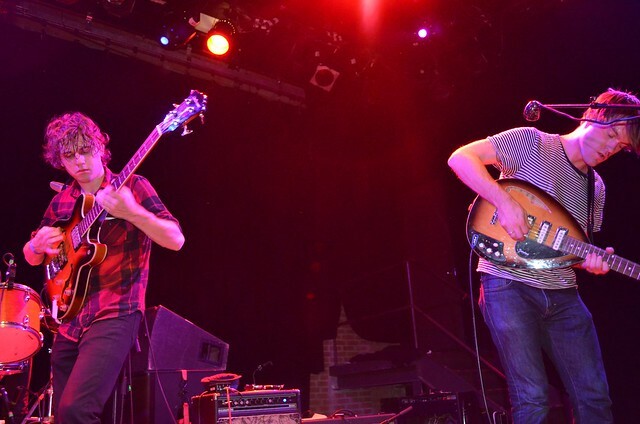 It also helped that the support bands included two other NYCTaper favorites, Widowspeak and Purling Hiss. We’ve recorded Woods for five years, and there are more than a dozen recordings on this site. Its a testament to the band that we keep coming back and find new things to enjoy about their music. In May at 285 Kent, we noted that longtime drummer Jarvis Taveniere had come out from behind the kit and played most of the set on guitar. As we learned speaking to Jarvis before the show, that change is now permanent. With a new drummer, Woods is now also apparently a quartet as original member tape-loop/effects player G. Lucas Crane was absent from this gig. But it was the addition of Jarvis’s guitar work, which included several different axes including a neat 12-string, that ignited the guitar interplay within the band. The main focus of the set was precise back and forth between Jarvis, Jeremy and bassist Kevin Morby, who anchored center stage. The show began with a segue of three folk numbers before the band got a chance to stretch out and jam a little with new album title track and longtime jam vehicle “Bend Beyond”. The guitar trio seemed to be having fun on stage and their enjoyable interplay culminated in the highlight of the night an intense 15-minute “I Was Gone” that we are also streaming below. Its these types of performance that will keep us coming back, as this band continues to evolve into one of the best live acts around. Acidjack and I recorded this set from the center and back of the soundboard booth mixing the Sennheisers with an excellent feed. The result is a superb capture. Enjoy! Download the Complete show in [MP3] or [FLAC]. If you download this recording from nyctaper, we expect that you will PLEASE SUPPORT Woods, visit the Woodist page and purchase their official releases including new album Bend Beyond from Woodist Records [HERE].